Layton, Utah — More than 1,500 cyclists will depart from Sunrise Cyclery in Logan, Utah and will pedal north to Jackson Hole, Wyoming in the 32nd Annual LoToJa Bicycle Classic on Saturday, Sept. 6. Started in 1983, the one-day, 206-mile race and cyclosportive attracts cyclists from across the U.S and several foreign countries. Held on county and state roads, the course passes through northern Utah, southeastern Idaho and western Wyoming. In addition to the long distance, the course features three mountain passes that total nearly 10,000 vertical feet. The finish line is at Jackson Hole Mountain Resort within sight of the iconic Grand Teton. While en route, cyclists pass through Preston, Idaho and Montpelier, Idaho, and the Wyoming communities of Afton, Alpine and Hoback Junction. The current record is 8:57:19 set in 2012 by Leon Bergant of Layton, Utah. His average speed was nearly 23 mph. The current women’s record of 9:35:00 was set last year by Melinda MacFarlane of Salt Lake City, Utah. Her average speed was approximately 21 mph. Most of the other cyclists usually cross the finish after 10 to 12 hours. Despite LoToJa’s enormous challenge to a cyclist’s fitness and courage, many return year after year. At registration each spring, up to 4,000 applications are received — but less than 2,000 can be accepted because of permit requirements. Chambers said that cyclists are coming from 40states, some as far away as Florida and Hawaii. From outside the U.S., riders are coming from Sweden, China, Canada, and the United Kingdom; the majority, though, are from Utah and other western states. The LoToJa began in 1983 by two Logan cyclists who wanted to create a bicycle race that resembled the difficulty of a one-day European spring classic like Paris-Roubaix, the de Ronde Vlaanderen (Tour of Flanders) or Liege-Bastogne-Liege. In that first year, seven cyclists competed and crossed the finish line in Jackson. 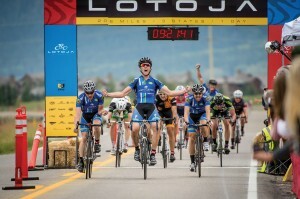 Since then, LoToJa has become one of America’s premier amateur cycling races. It has also become a major fundraiser for the Huntsman Cancer Foundation, Autism Spectrum Disorder Connections, and other medical research foundations. To date, sponsors and participants have raised more than $1 million for these causes. In addition, LoToJa sponsors local fund-raising groups that assist the event. This year’s race again serves multiple categories for USA Cycling license holders, plus a “Cyclosportive” or grand fondo class, which consists of non-licensed cyclists who are either competing against riders within their age group, or are just riding for fun. A relay race, and categories for tandem riders, will also be held. The LoToJa is the longest one-day bicycle race in America that is sanctioned by USA Cycling, the sport’s governing body. The age of cyclists range from 13 to 72 (11 to 84 in the relay category), and the average rider will burn up to 15,000 calories on race day — about a dozen large cheeseburgers with fries. A safe race for all cyclists, support crews and volunteers is LoToJa’s top goal, added Chambers. Motorists traveling LoToJa’s course on Sept. 6 are asked to use caution when approaching cyclists. Groups consisting of up to dozens of riders may be encountered. Motorists are urged to pass carefully and to leave a safe distance between their vehicle, cyclists and other traffic. To further increase safety, on race day the Idaho Department of Transportation will restrict eastbound traffic on Highway 36 north of Preston between Riverdale and Ovid from 7 a.m. to 12:30 p.m. Eastbound traffic on US-89 between Montpelier and the Wyoming state line will also be restricted from 9 a.m. to 2 p.m.
Cyclists who compete in the event, plus their support crews, well wishers, event staff and volunteers, result in an entourage of approximately 4,500 people. Several of the communities through which LoToJa passes organize roadside fundraisers to capitalize on the influx of visitors. The host cities of Logan and Jackson also enjoy a welcomed economic boost from the race, specifically restaurants and motels.